In a different article I already discussed the Lambda sensor. There, I already mentioned that a lambda sensor measures the amount of oxygen in the exhaust gasses, and that it can generate a small voltage to produce a signal. This signal is then used by the ECU to adjust the amount of fuel that is injected into the cylinders to create the best possible air/fuel mixture. We already know that for petrol engines, the optimal air/fuel mixture is 14,7 parts of air for every 1 part of fuel. This mixture is also known as Lambda 1. This is all the same for every Lambda sensor. But not all Lambda sensors or equal. The Lambda sensors that were discussed in the earlier mentioned article and that are fitted to most cars are known as narrowband Lambda sensors. The name already speaks for itself, the range in which these sensors can measure is limited (narrow). It also can't determine what the exact mixture is. It can only see if Lambda 1 is reached. If this is not the case, it can only tell the ECU that the engine is running lean or is running rich, but not by what amount. To simplify this a little: The sensor sees Lambda=1, Lambda<1 of Lambda>1. That's all it does, it's up to the ECU to work with this information and adjust the fuel injection. As it can't get any information on just how much the amount of fuel needs to be adjusted, it can only adjust it in little steps until the lambda sensor let's the ECU know that it has reached Lambda 1 again. For instance, if the engine is running to lean, the Lambda sensor will let the ECU know that it sences little oxygen in the exhaust gasses. The ECU will then start to increase the amount of fuel it injects into the cylinders and will continue to do so until the Lambda sensor lets it know that it has reached Lambda 1. By then it usually overshoots and will have to reduce the amount of fuel again, and so on and so on. This effect is called a hysteresis loop and makes the ECU constantly making small adjustments and corrections in the fuel injection. This all costs time and isn't very precise. The ECU is actually constantly adjusting the fuel mixture and is lagging behind with the fuel mixture all the time as a result of that. Now this isn't really a problem for everyday driving on the road. But a high performance engine that is operating on the edge needs more speed and precision. Enter the wideband lambda sensor. Again, the name gives away what the big difference is with the narrowband sensor. The wideband sensor has a much wider range and is a bit more advanced than the narrowband lambda sensors. It has a better measuring cell build into it that acts a lot faster to changes in the amount of oxygen. And besides that, it can also give a actual reading of that amount of oxygen. This makes it a trusted and precise measuring instrument we can use to hone the performance of the engine with. 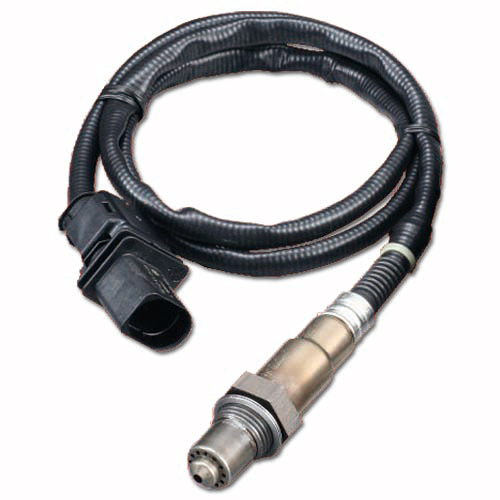 We also need the wider range of this type of lambda sensor, because performance engines tend to operate with air/fuel mixtures far outside the normal operating range of the narrowband sensors. At full throttle, these engine can dump so much fuel into the combustion chamber that the air/full mixture can take a dive to 11:1, well out of range of the narrowband sensors that usually only go down to 13,8:1. These engines deliberately run rich to aid cooling of the pistons and avoid detonation or pre-ignition. From the outside, you can hardly see the difference in the sensors, they look very much alike and are mounted in the same ways. But the signal they generate is very different. The difference in signals from a narrowband (blue) and wideband (red) lambda sensor. Where a narrowband lambda sensor has a voltage range of 0,1 to 0,9 Volts and can measure between approximately Lambda 0,8 to 1,2. A wideband lambda has a voltage range of 0,1 to 5,0 Volts. This gives it a measuring range of about Lambda 0,65 to 32. Far beyond what we actually need. Wideband lambda sensors always have a internal heating element to get them up to operating temperatures fast. That operating temperature lies somewhere around the 750ºC. The wideband lambda sensor highly depends on it's heating element for it's accuracy, as the temperature is a important variable in the measuring process.